On this day in 1938, at 5:15 a.m., a plane named Sunshine took off from Floyd Bennett Field in Brooklyn. Its pilot had filed a flight plan to return home to Long Beach, California – but after taking off to the east, it kept going. 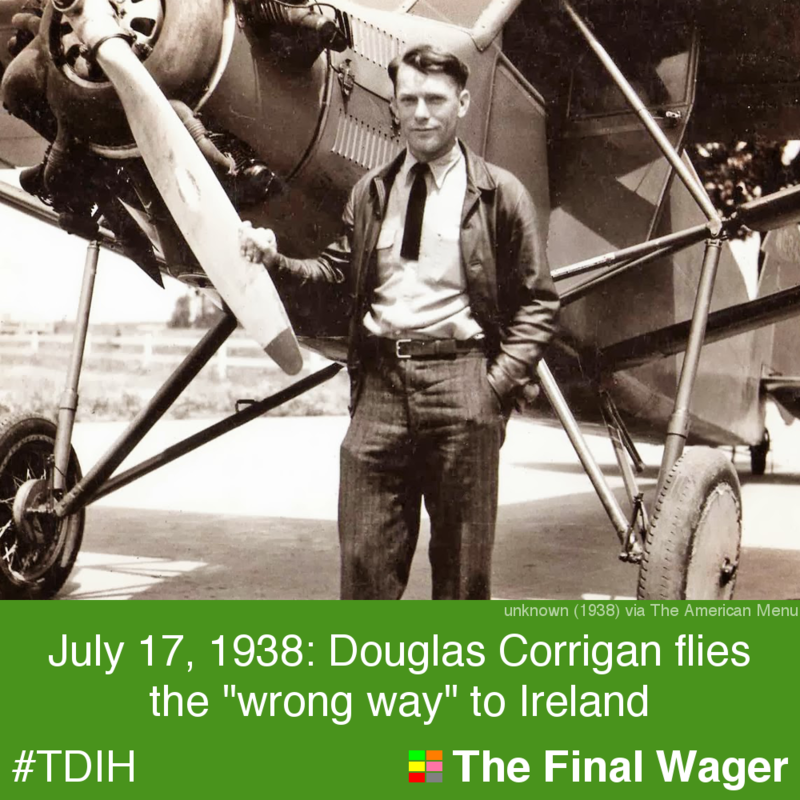 He was thereafter known as Douglas “Wrong Way” Corrigan. It was a bit of Depression-era magic: a hero with the gall to do what he wanted while sticking his tongue out at authority. Over the course of several years, Corrigan had been denied repeatedly permission to fly across the Atlantic. He (allegedly, of course) decided he’d fly to Brooklyn and take off at night when no one was around to stop him. He tried the plan in 1937, but easterly winds and the incoming “unsafe” season over the ocean made him head back to California – and to rename his plane, a second-hand craft he tricked out with long-range improvments. Corrigan’s punishment was a 14-day suspension of his license, during which time he was sailing home from Europe for ticker-tape parades in New York City (where more people showed up than did for Lindbergh in 1927) and Chicago. He never admitted to his plan; in fact, he called his autobiography That’s My Story. The Times had an excellent obituary for Corrigan in 1995.